PRP therapy for hair loss treatment is showing promising results. Hair loss and thinning of the hair can be problematic for both men and women. Treatment options currently are medication and hair graft surgery. However not all people can tolerate the medication and not everyone wants to go through surgery. PRP may now be able to provide people with an alternative measure to improve hair loss. It can also support the long term use of medication to restore new hair growth. PRP therapy has been used in various fields of medicine including oral surgery, plastic and cosmetic surgery and sports medicine for over 20 years. Clinical data and scientific studies show that PRP is beneficial in wound healing and tissue regeneration. This is because the PRP serum that is extracted from your own blood contains tiny cell fragments called platelets. These platelets possess important biological contents, some of which are called ‘growth factors’, which are vital for tissue regeneration. Considering the many applications PRP therapy has, Dr Candler offers these treatments not only for hair loss, but for skin rejuvenation and arthritis as well. With constant advancements in research and technology, scientific studies demonstrate that PRP is beneficial in wound healing and tissue regeneration. It is not considered to replace traditional methods of hair loss treatment (medication and surgery), but it shows promising results as another treatment option that may be used exclusively, or in combination with other approaches. How does PRP therapy work for hair loss? A concentrated serum of platelets suspended in plasma derived from your own blood is injected into the scalp. Once activated, the platelets will release a bounty of essential growth factors and other contents that are vital for hair growth stimulation and tissue regeneration. The purpose of PRP for hair restoration is to stimulate new hair growth in dormant follicles, and enhance hair growth in weaker follicles. Hair growth follows a normal physiological growth cycle pattern. The ‘anagen’ phase of hair growth is when a hair is actively growing and connected to a blood supply. This essential blood supply feeds the hair follicle with the nutrients needed to grow strong healthy hair. PRP therapy aims to stimulate new hairs and dormant hairs to thrive in this anagen phase of hair growth. From there the hairs will regrow stronger, and, hopefully with more density. Your clinician will draw your blood here at the clinic, just as if you were having a regular blood test. The blood is then spun through a centrifuge, which splits the red blood cells from the fluid portion of your blood (plasma). This plasma is then carefully extracted to become your very own platelet-rich plasma serum. This serum, containing all the ingredients for tissue regeneration and hair growth stimulation, is then re-injected into your scalp where it will begin its vital functions. Because the serum is derived from your own blood, there is minimal risk of infection or complications. PRP is regarded as a very safe treatment to perform and receive. Does PRP therapy for hair loss work? There is strong evidence to suggest that PRP successfully stimulates new hair growth. As with all treatments, results will and do vary from patient to patient. PRP is not considered to be the first line of action in the treatment of hair growth and hair thinning, but data is showing us that it has its place. Being a non-surgical ‘natural’ option, it can offer good results for a range of patients. It can also be useful when combined with traditional hair growth treatments like medication or surgery. You will need to have an initial consultation with Dr Candler to see if this treatment is right for you. Anyone wanting further information is encouraged to schedule an appointment. This varies from all individuals. For some patients a regular PRP treatment every 4 months has shown to be effective in hair loss management. Others may benefit from an initial course of treatments every 2 – 4 weeks. Upon assessment from Dr Candler, he can advise you on what options will work for you. There are many variables that must be taken into account when having PRP treatments. There are consumables associated with this treatment, and this must be taken into consideration. Price also varies on the size and location of the treatment area. All pricing queries will be discussed with you during your initial consultation. 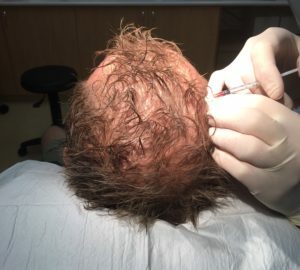 If you are interested in how PRP therapy might be able to help you with hair loss or hair thinning, please schedule an appointment with Dr Candler at Skin Alert Cairns.